Data Sources Ohio Elects the President, p. 59. The United Labor Party was founded in New York City in 1886. Its founder was Henry George, the chief proponent of the idea that re-organizing the government would bring about the end of poverty. He believed that land ownership was the key to the building of wealth at the expense of others, so he favored eliminating land ownership and a single tax that would bring equity to society. He became a popular lecturer in the 1880s. In 1886, he ran for mayor of New York City on the United Labor Party and came in second (future US President Theodore Roosevelt placed third on the Republican ticket). In 1887, Henry George believed that the party was on the rise and would carry the national election of 1888 [New York Times, 9/20/1887]. 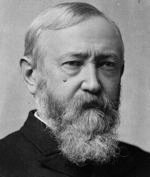 The party ran candidates in the 1887 races; George was the candidate for NY Secretary of State, and many nominees appeared on the NYC ballot. The party created a daily newspaper The Standard to support its principles [NYT 9/2/1887]. George did not perform well; while the party did not fare well in the NYC races, it fused with the minority Republicans in some races and was competitive [NYT 11/10/1887]. Although some party activists believed that George would be elected President in 1888, he downplayed such rumors [NYT 12/12/1887]. The United Labor Party fragmented in 1888. First, the local Catholic archbishop threatened excommunication of any members in the ULP. Second, a segment of the party left because of a difference of opinion regarding the tariff issue [NYT 1/29/1888]. Then Edward McGlynn, a local Catholic priest and social reformer who had broken with the Church, parted ways with George and the ULP [NYT 2/10/1888]. George, who favored free trade, printed an editorial in his newspaper The Standard which put him at odds with some of his remaining supporters. He indicated that he supported the re-election of President Cleveland in 1888 [NYT 2/16/1888]. The United Labor Party's sole national convention was held in the Grand Opera House in Cincinnati OH on 5/15-17/1888. The circumstances of the convention were confusing, as two national nominating conventions were held at the same time - the United Labor Party and the Union Labor Party. An effort was made for the two parties to run the same national ticket [NYT 5/15/1888]. The convention was called to order by John McMackin, national party chairman. The list of delegates was read without any objections. William B. Ogden of Kentucky was chosen as the temporary chairman. After a few speeches were made, Ogden was appointed the permanent chairman. One delegate from each state was appointed to draft a platform, and a committee of five was appointed to officially work with the Union Labor Party to attempt a united ticket [NYT 5/16/1888]. On the second day of the convention, 100 delegates were present. The committee on the platform was reporting when news arrived that the Union Labor convention was interested in the possibility of a united ticket. An initial committee report was adopted that was considered a first step towards the united ticket. Thereupon, the United Labor Party continued a consideration of its own platform and adopted planks that the Union Labor Party was sure to reject. That evening, the planks of the platform were discussed one at a time [NYT 5/17/1888]. The convention assembled at 10 a.m. for its final session on 5/17. Robert H. Cowdrey was nominated for President over Victor Wilder (50-12), and William H.T. Wakefield was nominated for Vice President unanimously. At 1:45 p.m., the convention adjourned sine die. [NYT 5/18/1888]. The party's sole campaign for US President was an ongoing process of disintegration. On 5/28, the party officially expelled Henry George [NYT 5/29/1888]. McGlynn convinced the party to change its name to the "Commonwealth Party" on 8/5/1888 [NYT, 8/6]. The New York state affiliate of the United Labor Party held its local conventions to organize the fall campaign, and discussions of the national platform caused more of its workers to leave [NYT 9/7/1888]. Amidst rumors that the United Labor Party leadership was supporting the Republican ticket, a conference was held in NYC at which Cowdrey spoke to about 1,000 gathered [NYT 9/16/1888]. At a contentious NY state convention, the delegates voted 131-67 not to nominate a candidate for NY Governor but then nominated a slate for other offices [NYT 9/21/1888]. The disintegration continued as the county conventions in NY debated whether to vote for Cleveland, Harrison, or Cowdrey [NYT 10/8/1888]. A convention to nominate a slate of Presidential Electors in Pennsylvania failed to do so, thus eliminating them from that state's ballot [NYT 10/13/1888]. Infighting among the party faithful resulted in a dismal performance at the polls. Cowdrey won just over 1,000 votes nationwide, of which half came from New York. The party affiliate there actually met after the election, and its organization continued to disintegrate, with charges of misappropriation of funds [NYT 12/28/1888]. Although the party ceased to exist, some of its ideas were brought forward later by the Single Tax Party.